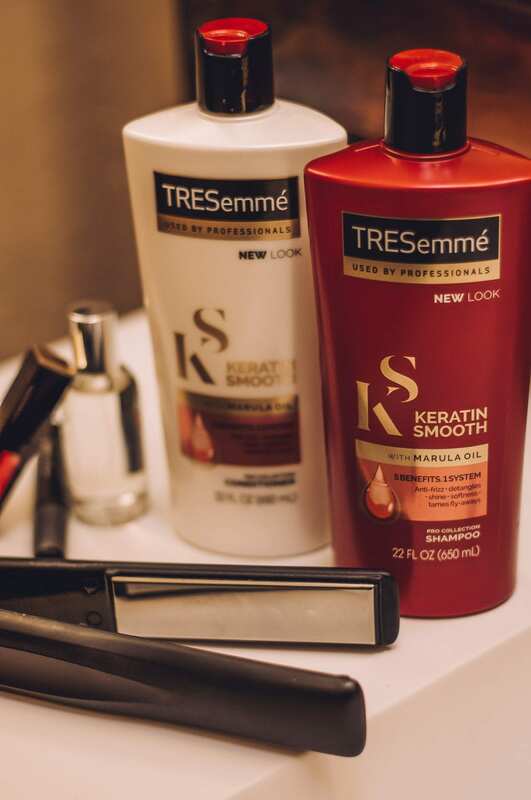 Whether you’re dealing with hair that is frizzy, curly, damaged, dry, or color-treated, TRESemmé has a solution and the perfect end-look for you! If you’re anything like me, you know one issue with your hair but not every single one. Take this short quiz to find out and get the best products for your hair type! Most of us use products that aren’t even benefitting our day, so it’s very important to identify your hair type and use the right products. Using products without knowing your hair type is not ideal since you’re just cleaning your hair and not meeting your hair’s needs. This is why I usually go for hair products that are relevant to my hair type. 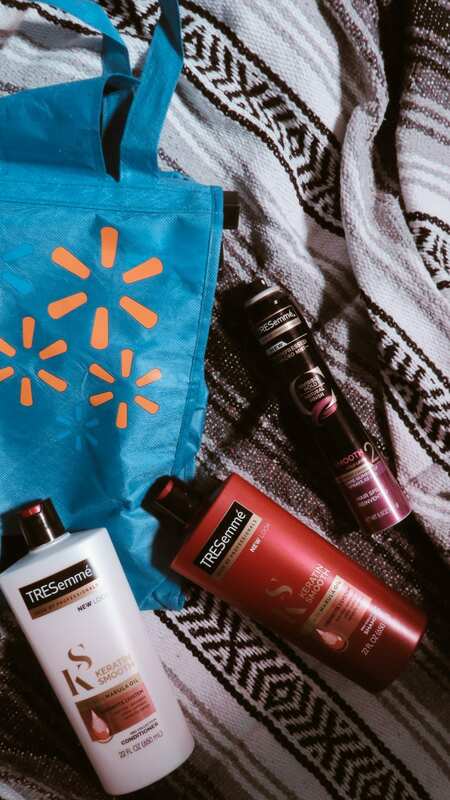 The best place to shop for this keratin treatment is Walmart. While I grab all my home essentials, I also grab my shampoo, conditioner and a little hair spray. In terms of a regular hair routine, I wash my hair with shampoo and conditioner approximately 2-3 times a week. The difference about this powerful system is that it’s going to fight that frizz. Since my hair is so fine, it getting super frizzy easily because every gust of wind wraps it around other strands of hair. Pretty soon, my hair is tangly and super frizzy. This system helps to mitigate that, and keep my hair slick and not frizzy! During marathon training, it wasn’t possible because any day I ran, my hair had to be washed but now that I’m out of the intense sweaty workouts, I can get my hair to a healthier place that doesn’t involve washing it every day. 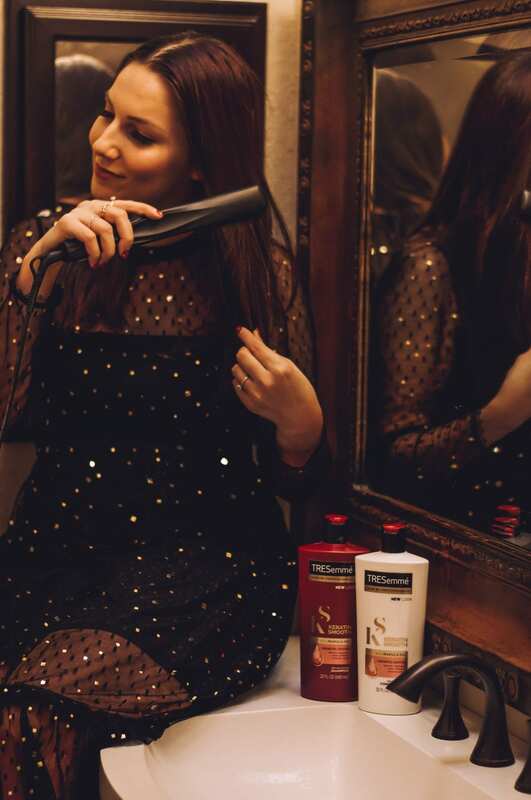 A lathering shampoo with the TRESemmé Keratin Smooth Shampoo gets me ready for the TRESemmé Keratin Smooth Conditioner. Since I learned about water damage, I like to do that quick condition (2 minutes max) and then get my hair toweled off and in a turban towel of some kind. Turban hair towels have a way of getting more moisture out quicker, which then makes the blow-drying process easier. In case you didn’t know, it’s in your best interest to get your hair dry quick. This is something I recently learned because water damage can be more damaging than heat damage, so it’s ideal to get your hair dry so the hair follicles are not wet for too long. The longer your follicles are wet, the more damage that is happening to the hair itself long-term. Once my hair is washed, conditioned and dried, I go to style it. Most days I keep it simple. I leave it straight, do a half up half down or an easy ponytail. 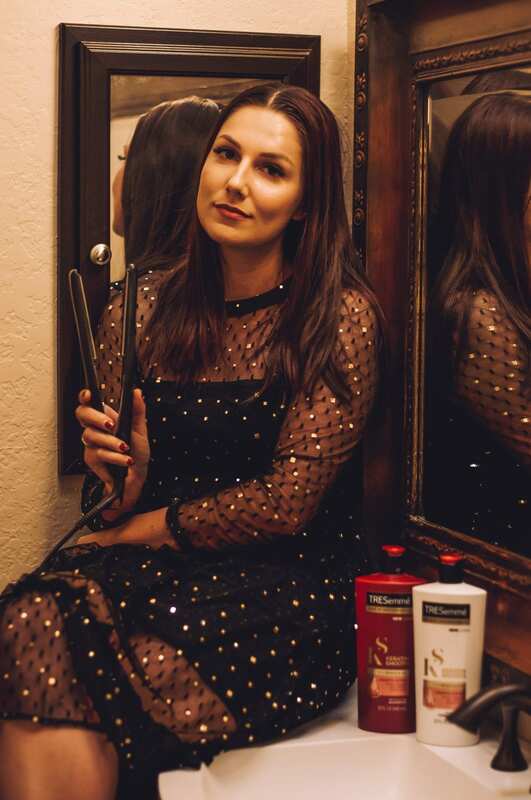 On special days, when I do want to put a little pizzazz into it, I take a curling iron and do a quick curl just to give it a little bit of a wave. Tonight, since I’m heading out to a special event I am straightening out the kinks in my hair to ensure it’s straight as can be. Something about this straight no frizz style, goes well with this gorgeous dress. And voila, I am all done. Of course, on a day to day basis, I don’t wash my hair. I turn to dry shampoo to ensure it doesn’t look greasy or overly flat. The greasier the hair, the flatter it falls for me. I always envy those who don’t wash their hair for a week, and you can’t see any grease on their scalp. Goals! Unfortunately that’s not me, so I turn to TRESemmé’s dry shampoo to get me through the greasier days. What’s your hair routine look like these days? I know my friends have such different patterns and it’s always interesting to see what everyone does to get their locks perfect. Make sure to take the quiz to find out the best solution for your hair!